One of the "great unknowns" of the diamond world, the Walska is a 95-carat yellow briolette cut stone. Its size and cutting style rival the Briolette of India, a 90-carat stone and probably the most famous diamond of this cutting style. 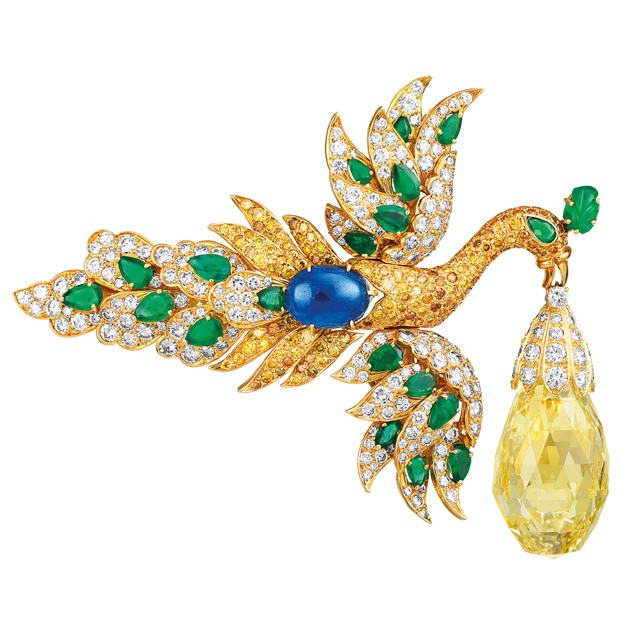 It is set in a bird-motif brooch/pendant, the wings can be detached to become earrings; the drop yellow diamond extending from the beak is a pendant or leaving the tail as a brooch. The piece was created by Van Cleef & Arpels in 1971. Unfortunately not much else is known about the Walska. Perhaps someday more will be published about this stone. What is known is that Ganna Walska (1887-1984) was a Polish opera singer and her birth name was Hanna Puacz. She was also an avid gardener and created Lotusland, a 37-acre estate and botanical garden east of Santa Barbara, California. Walska bought the property in 1941 and owned it until her death in 1984. Before her death, Madame Walska established the nonprofit Ganna Walska Lotusland Foundation, which now preserves this botanical treasure. The brooch and diamond are now privately owned but it occasionally appears at historical jewelry exhibitions.